Those of you that have been around my blog for a while know how much I love Comic Life on the Mac. I've used it in several conference presentations and people always ask if its Mac only. I always sadly say yes...until NOW! 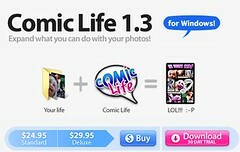 The Windows version is out and available for purchase at plasq.com. These guys also have created an amazing little screen capture app called Skitch which I also LOVE!!! Its invite only and I have about 20 invites to give away. Comment with an email if you want an invite. Please may I blag a Skitch invite too? You can use "barry_sampson AT hotmail.com"
I also love Comic Life and am interested in what Plasq is up to with Skitch. It looks really interesting and useful--not to mention, fun. Please send me an invite to download the beta if you still have one available. Thanks for the invite Brent.